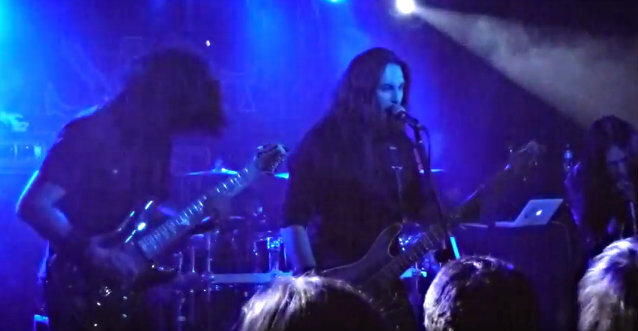 Fan-filmed video footage of SCAR THE MARTYR's December 14 performance in Manchester, England can be seen below. SCAR THE MARTYR is the new band led by former SLIPKNOT drummer Joey Jordison. The group's self-titled debut album sold around 3,300 copies in the United States in its first week of release to land at position No. 129 on The Billboard 200 chart. The CD was made available on October 1 via Roadrunner Records. In addition to Jordison and lead vocalist Henry Derek Bonner (BLOOD PROMISE), SCAR THE MARTYR's current touring lineup features guitarists Jed Simon (STRAPPING YOUNG LAD) and Kris Norris (DARKEST HOUR), keyboardist Joey Blush and bassist Kyle Konkiel (IN THIS MOMENT). SLIPKNOT announced on Thursday (December 12) that it had parted ways with Jordison, one of the band's founding members and key songwriters. The group posted a statement at its web site which read, "It is with great pain but quiet respect that, for personal reasons, Joey Jordison and SLIPKNOT are parting ways. We all wish Joey the best in whatever his future holds. We understand that many of you will want to know how and why this has come to be, and we will do our best to respond to these questions in the near future." The statement added, "It is our love for all of you, as well as for the music we create, that spurs us to continue on and move forward with our plans for releasing new material in the next year. We hope that all of you will come to understand this, and we appreciate your continued support while we plan the next phase of the future of SLIPKNOT." SLIPKNOT is slated to begin work on a new album in 2014, the band's first since the 2010 death of bassist Paul Gray.